This line up looks pretty good and it's for a good cause. 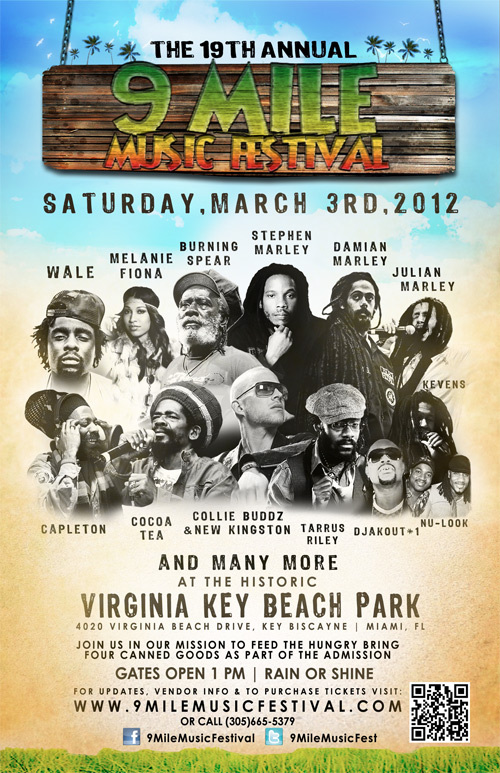 The 9 Mile Music Festival began as a labor of love, Pioneered by, Cedella Marley Booker. Over the years the festival has had other names including “The Caribbean Music Festival” finally evolving into what is known as the 9 Mile Music Festival today. This reggae music event is more than just your average “concert”, it has a commitment to doing good and spreading love. The 9 Mile Music Festival is responsible for collecting over two (2) million canned goods over its 18 year span, in an effort to continuously give back to its community. Four canned goods are required for entry, along with a purchased admission; the canned goods collected are then distributed to shelters in Miami & Jamaica.